All The Ways I Failed This Year...And Why I Love Them. 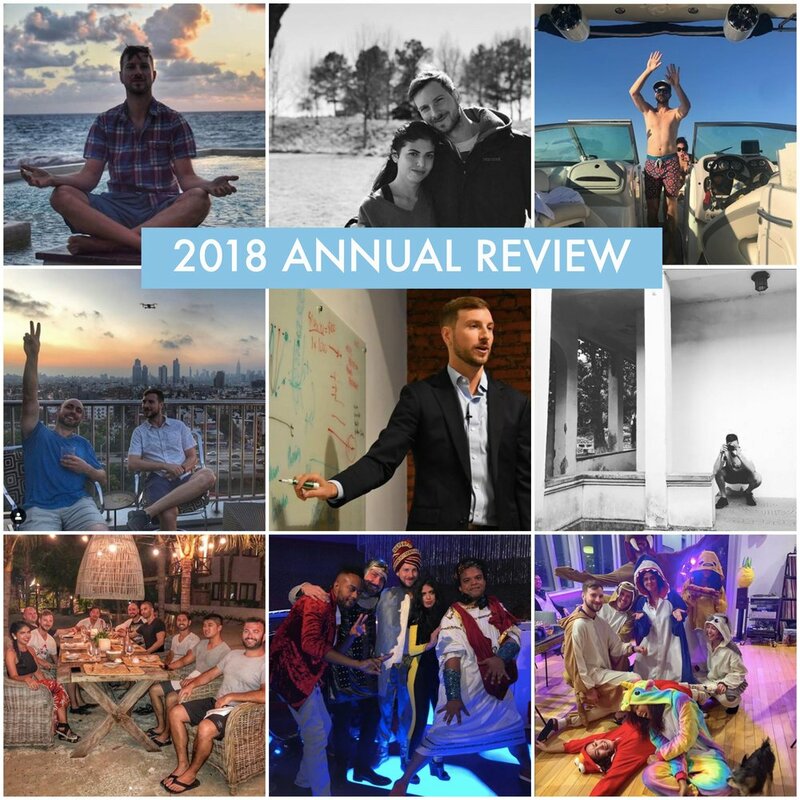 The purpose of my annual review is to reflect on the year which has passed so that I can celebrate my wins, diagnose my failures, and prepare for a successful year to come. By holding each other accountable, our success becomes exponentially more likely. Each action of vulnerability is a small step towards integrating the public and private versions of myself. I want our future conversations to be framed around helping each other reshape the world and become the best possible versions of ourselves. I might inspire you to do your own reflection and planning. In 2018, what were my biggest wins? What did I learn from each? In 2018, where were my time, attention, and energy best spent? How can I double down in these areas? In 2018, where could my time, attention, and energy have been allocated more effectively? How can I make this a reality? What does everyone around me know about me, that I don’t know about me? Who do I need to become for the 2019 chapter of my life story to turn out the way I would write it? If I had to accomplish all of my goals for the next decade in 2019, what would I do? To create this post, I compiled and recategorized these takeaways into six key areas: Mission, Wealth, Health, Relationships, Adventure, and Performance. For each of these areas, I will try to share my biggest wins, setbacks, and lessons learned for each of these areas. This may be way more detail than you asked for so feel free to skip around to any sections that interest you. The growth of The Forcing Function this year reminded me of bamboo: massive roots taking hold but less visibility above ground. I see the business as being in the midst of a phase change, moving from entry-level systems installation i.e. “productivity” towards behavior optimization i.e. “performance”. New client signings for 1–1 coaching were down this year as my inbound transitions from referrals to content marketing. As degrees of separation increased, I accepted fewer clients and my close rate went down. Overall revenue was flat thanks to a strong client renewal rate. I decided that publishing my book, Inflection Point, was a prerequisite for making this transition to the next stage. In the meantime, I put marketing in a state of “maintenance mode” to ensure that Inflection Point (and now The Manual) are truly transformational. In the meantime, we did a major facelift of theforcingfunction.com and the rest of my digital presence. I started The Forcing Function to accelerate the learning curve of those with high potential to change the world. Having other sources of income allows me to deprioritize the bottom line to optimize for impact and fulfillment. I challenged myself this year to work with more mission-driven entrepreneurs and to be relentless about ensuring personality fit up front. As a direct result, I loved every single coaching conversation I had this year. Big energetic shift. Last year, I found myself emotionally spent after many client calls. I leveled up on the scale and difficulty of problems clients entrusted me to help solve, my primary dimension for evaluating my progress as a coach. Personal productivity reaches its inherent limits. In order to accomplish anything of sufficient scale, I will need to leverage my resources and develop the ability to attract, align, and accelerate specialized talent. If this is an essential skill, I might as well get the mistakes out of the way now. The cost of tuition will only get higher. I challenged myself this year to reinvest all company revenue to explore the potentialities of delegation. Karina was instrumental in streamlining operations to minimize time spent on the administrative side. Michael has increased my visibility and streamlined my messaging, securing media placements and acting as my defacto project manager. Tasha, my executive assistant, made progress multi-dimensional as projects no longer sat on the backlog, which cleared up massive amounts of mental bandwidth. Huge moves. The Forcing Function was a one-man-show and occasional afterthought and now I have managed to surround myself with a pretty incredible team. Learning how to delegate is not a free lunch. There have been bumps in the road with significant time and resources evaporated as I discover the boundaries of what can be successfully handed off. Still, my managerial skills have progressed significantly and I expect improvement here to be the primary source of future productivity gains. My primary writing goal was to publish Inflection Point, but there were some major setbacks. The year started off strong, but progress stalled out when poker action picked up in the spring and my time and discipline were at a premium. After expanding the team in July, I decided this was a great opportunity to get the train moving again. The plan was to interview me and have a offshore writer convert transcripts into outlines and drafts. I was all too happy to hand off the responsibility for a project which had become quite a slog and was now collecting dust on the shelf. My hope was that I could play executive chef and put the finishing touches on the dish before sending it out into the dining room. It was a complete disaster. The result was even worse than my original first draft and I ended up throwing it all out. Three months down the drain. My own fault for lack of oversight and trying to cut corners. If this thing is going to be done right, I need to be the one at the keyboard. Too much money in the pot to fold now, have to see this one through. The primary goals for 2019 remain the same — publish and build. I have decided to separate out the exercises from the book as The Manual. This will be a 100-page guided companion workbook with diagrams, exercises, and examples to install the habits and systems for peak performance. The Manual will be given away and launched in March along with my weekly newsletter to email subscribers. For the newsletter, each week I will distill one of my core principles for peak performance and deconstruct how top performers install and embody those principles. Inflection Point should be wrapping up at the end of Q1 and then I’ll start exploring publication options. I spent very little time on social media this year. Seems I was somewhat dependent upon the algorithm for social and business inbound. Without a mission purpose, I’d happily delete all my accounts. Social media seems to be a Soylent for human interaction and I dislike how it reorients my perception of what is important and urgent towards the trivial and ephemeral. At the same time, I see friends gaining network traction and undergoing massive mental refactoring. It makes me wonder how much value my perfectionistic tendencies are causing me to leave on the table. I can’t decide whether to surrender to the stream or unplug completely. Could go either way. 2018 was the year that I became a great speaker. All behaviors seem to solidify with enough repetition. I think it really clicked for me with podcasts. On every podcast, you give slight variations of the same message, giving the tight feedback loops which allow for convergence upon the uniquely interesting. It took me far too long to realize that a listener retains maximally through simplification and demonstration through personal narrative rather than compression or abstraction. I’m looking forward to guesting on quite a few podcasts again this year, most likely to coincide with the launch of Inflection Point. I spoke in person a handful of times but continued to be disappointed in the impact compared to the effort. Despite the usual praise, attendees had not taken any concrete action afterward as a result of my words. Clearly, I was doing something wrong. The world has enough feel-good motivational speakers. I wanted to experiment with a more intensive, hands-on workshop format to drive lasting behavioral change. The opportunity arose when Ian, my friend, mentor, and an incisive executive coach, approached me to partner on an event which we decided to call Founder Summit. The idea of Founder Summit was to teach an intimate group of ten entrepreneurs the skills they would need to transition from Founder of a small business to CEO of a growing company. I shared all of my best practices for maximizing personal performance (building systems and habits, optimizing time/energy/attention) and Ian taught a masterclass in management and communication. Feedback was overwhelmingly positive and it is clear that workshops are much more successful in driving action. We spent over 100 hours over three months putting together Founder Summit between content, sales, and logistics. None of my marketing efforts paid off and with a week before the workshop, we had not sold a single ticket. We ended up handpicking entrepreneurs from our network and messaging them directly with why we thought they personally would benefit from attending. Every single person we messaged who was in town decided to join us and in two days we went from almost canceling the event to breaking even on a first-time event, which felt like a relative success. Performance touches upon just about everything, so it was quite the challenge to compress the entirety of my knowledge and experience into a two-hour lecture. In hindsight, the forcing function of this compression was the biggest win of the entire experience. I can now speak about any aspect of performance at a moment’s notice. Moving forward, I’d like to partner with organizations looking for programming who can fill a room with entrepreneurs so that I can lead more workshops like Founder Summit without the heavy lift of sales and logistics. Finally, I learned how valuable it can be to create space for reflection for others when I co-led a quarterly review workshop for a small group. Giving reflection prompts, setting a timer while they wrote, and facilitating sharing… it almost felt like cheating. Behavior change is proportional to your ability to cast light upon someone’s invalidated assumptions. Getting tautological: reflection is maximally reflective. I took this insight to the next level when I partnered with David to lead an Annual Review Retreat on a lake in upstate NY. If an hour of reflection is good, what would happen with two full days away from the city? It was great to be reminded that 1) if you get the right people in the room, everything else is a bonus and 2) I really love creating amazing experiences for others. At the retreat, we had guided writing exercises, hot-seats to battle test our plans for 2019, and a full day of team activities to build lasting friendships and end on a fun note. Already planning the next one. TL;DR I made a ton of money from poker this year, one of my best years since I began playing in 2004. Not bad considering I had assumed I would never be able to win in online poker ever again. The continued possibility of this second career never ceases to amaze me. In poker years, I’m an old hardened soul. The majority of my toughest competitors just gave away their fake IDs. To me, Black Friday was the ninth inning and now we’re just trying to hold on in extras. I try to mentally prepare myself for the rug being swept out from under me for the second time. I treated poker opportunistically, aiming for a 50/50 focus split with The Forcing Function. I played an average of 75 hours/month, with the vast majority on nights and weekends. The months where my hourly was the highest (April, Dec) I put almost everything else aside. Playing 40 hours/week (plus extensive study) is probably the equivalent of 100 hours/week in an office with a less healthy schedule, but it was completely worth it. I took on my first poker student who under my supervision progressed through all of the stakes and had the best year of his entire career. Coaching other players was a huge propellant of growth in my first poker career and I really enjoy being a mentor so I plan to expand this program this year. In June, the primary online deposit/withdrawal method was removed and all feared that the sky was falling. The games did get significantly harder, but I accepted the challenge to improve and my bottom line was almost unaffected. My primary limit (10/20NL) was recently removed which might have a similar effect. Any change outside of our control creates an inflection point. We can either treat the change as an excuse to lower our expectations or as another opportunity to differentiate ourselves. Confidence is a leading indicator. Last year, I tried to maximize my poker time on actual play rather than study. This made sense when game quality was fairly static and my time was limited. In many ways, my style of play had not changed at all since my retirement in 2011 and the best practices for strategy had shifted quite a bit. As the games continued to get harder, I found myself having to become more selective on which lineups I played in. I spent considerable time updating my game so that I could feel confident of holding my own against any other player. The new psychological edge was intangible but invaluable. The biggest winner doesn’t compete. As a poker player, attention is generally inversely correlated with earnings. The optimal is to be known enough to be respected and feared but not so much that others dedicate resources to defeating you. This year, as the competition stiffened, I ceased being a lone wolf and emphasized community building. For the first time in poker career v2.0, I allowed myself to be more than just a screen name. Cooperating with other professionals increased my engagement, awareness to change in play environment, and motivation to play. Given the high-variance nature of poker, I continued with a relatively passive, low-cost, low-beta approach to investing my winnings from the tables. Ended up in the red after a poor Q4. I continue to time the market poorly, even with dollar cost averaging, as poker earnings tend to coincide with market cycles. Emotional control, decision fatigue, overly conservative bet sizing, and low tolerance for administrativa continue to drag on overall performance. I’m currently sitting more defensive and cash-heavy, with the plan to become active in seeking out alternative income-generating investments should the macroenvironment shift. It is a bit concerning that I don’t have a great idea of how much I spent this year. The number is high, the most since the Young Guns era of bottle service and degeneracy in the Hollywood Hills. I was (and am) very much in investment mode, looking to completely solve or greatly accelerate progress in all major areas. Still, I would like to regain awareness so that I can trim the fat, especially on recurring expenses. I worked with trainers and specialists to accelerate progress, increased preventative care, worked with a therapist, and began a weekly recovery regimen. I went from doing everything myself to managing a team of contractors. I updated my look and my personal identity by overhauling much of my wardrobe. I did a lot less eating out at restaurants, ordering delivery, and stopped drinking alcohol. A major goal for 2018 was to solve nutrition by partnering with a personal chef. The massive difference in energy levels that I experience when I eat right have become obvious, and I have no interest in cooking. I was fortunate to be connected with Leslie who now does weekly meal prep for us. Her food is healthy, dairy/gluten free, and takes minutes to prepare, not to mention it’s delicious. Having a personal chef seems like an extravagance but if you’re able to split the cost with friends or roommates it can actually be less expensive than cooking. I got my first quarterly comprehensive blood test through WellnessFX for preventative alerts and tracking the effects of lifestyle changes. All the systems checked out, which is a big relief. The only two areas of concern were heightened inflammation and cortisol levels caused by stress, likely poker-related. Adaptogens and turmeric seem to help quite a bit. Like many, I have started compressing my eating window (currently 10 hours) and am curious to experiment with day-long fasts to see what might change in my energy levels and test results. I continued to solve exercise by working out twice a week each with an amazing personal trainer and private yoga instructor with a focus on improving mobility, flexibility, core strength, and bilateral movement. Again I find myself in the best shape of my life. I am at the same weight as at the start of the year, but with the additional muscle, I’ve changed clothing sizes for the first time in a decade. Years of sitting for hours on end has taken its toll and I have started work with a physical therapist for postural corrective exercises with plans to experiment with pilates in the new year. My cardio can still improve. I love biking but rarely do because of the friction involved with retrieving my bike. I plan to use CitiBike as my primary mode of transport intra-borough and to sign up for a multi-day bike tour to encourage myself to get on the bike more often when the weather turns. Sleep is still a limiting factor. In an ideal scenario, I would have consistent sleep/wake times each night allowing for 9 hours in bed a night and a syncing up with the working world. However, between playing poker and enjoying NYC, I found myself going to bed anywhere between 11 PM and 6 AM on a given night with an average of 1:30 AM. This was compounded by lots of nights spent tossing and turning which meant that only 70% of my total time in bed was spent actually asleep, with some nights even less than half. Despite suboptimal circumstances, I assumed that there were ways to improve my sleep quality and efficiency. I partnered with Dr. Stern, a specialist in sleep, to rule out any disorders and to supervise changes to supplements and environment. I overhauled my bedroom to block out light and optimize temperature and comfort. I started exposing myself to more sunlight in the morning and wearing blue light blockers in the evenings. Slowly, I began to see improvements to sleep efficiency and my percentage of deep sleep as measured by my Oura Ring. Even though I am still not spending enough time in bed, I have gained one extra hour of sleep per night since beginning to examine my sleep. The difference in how I feel after this shift is massive and I am aiming to increase this by another 30 minutes to 7.5 hours/night. At a certain point, the bottleneck to growth is our own willingness to grow. I had noticed a recurring pattern of self-defeating behavior caused by conflicting urges. It seemed that I was irrationally afraid of failure or public inconsistency and that I would over-index on the opinions of others. This fear caused me to avoid challenge and uncertainty and often manifested as outsized emotional reactions to relatively trivial setbacks that happened to scratch upon old wounds. I was holding back in my mission, experiencing occasional tilt at the poker tables, and feeling less present and confident in my social interactions. Internal Family Systems, with its focus on modularity of the mind and reconciliation of repressed traumas, seemed promising and I found a therapist with whom I had a good rapport. Together, over three months, I gained visibility, empathy, and additional control over the younger parts of me who took over the reins whenever my ego felt threatened. I am more confident socially, have more emotional control, and am less afraid to risk failing at something new. Unlike CBT, which is more process-oriented, I do not think I would have made these breakthroughs without the guiding hand of a professional. I share this experience in the hopes that anyone who has struggled with similar patterns may be encouraged of their worthiness and feel empowered to seek professional assistance. This year, I identified two major factors that correlated with feeling uninspired — a lack of 1 on 1 time with close friends and a lack of self-care. My hypothesis is that both of these activities generate feelings of an abundance of ideas, opportunities, and blessings. I would sometimes burnout by working the entire day without stopping to reflect or recharge. I found that the only way to ensure self-care was to try to anticipate burnout and pre-commit in advance with prepayment or scheduling. My go-to activities were the sauna, massage, and sensory deprivation. Sauna worked especially well as a weekly staple because I could combine it with seeing friends… two birds! It’s cliche, but I relearned the importance of family this year. It’s easy to take our family for granted, thinking they will always be there, but our future time together is not guaranteed. This year, we decided to join my mom and sister on a cruise to Bermuda instead of going to Burning Man. It wasn’t my ideal destination or choice of transportation, but it was a great opportunity to spend time outside of the usual holiday context and sets the table for future trips together. I ended up winning a cabin for another cruise in December so perhaps this won’t be my last cruise after all. Now that I have done well for myself, I want to actively seek opportunities to serve those who did everything they could for me earlier in life. My initial concern was that I was I was motivated out of reciprocity or guilt. Now I have realized that I want to help simply because it feels good and I am fortunate enough to be in a position to do so. I will repeat my usual dating advice here. “If you find the right person, things will always be good. If you’re with the wrong person, nothing you do can make it good.” I feel very lucky and thankful to have found Marianna as the last four years (!) have been nothing but good. How can I enjoy so much the company of someone with whom I spend the majority of my waking moments? No idea, but it’s pretty nice. It had been obvious to me that Marianna was the most qualified person around me to help take The Forcing Function to the next level. She’s an excellent writer, skilled with operations, on top of the details that I tend to overlook, and the person I trust the most. I was super hesitant to complicate our relationship by adding the potential stress of a professional dimension. She insisted on a trial and we worked so well together that I decided to make her a full partner in the business. I also asked Marianna to come on as co-writer of Inflection Point to help make my writing more clear, concrete, and concise. Color me surprised… love and business can indeed co-exist. My struggle to find balance with poker probably affected Marianna the most. I was busy many evenings, was unable to commit and/or frequently canceled on plans, and operated on a ridiculous and unpredictable schedule. She was both understanding and super supportive. In my observation of poker girlfriends, this is quite the rarity and makes a massive difference. For my part, I wanted to ensure that we always had enough dedicated time with just the two of us. First, I instituted a weekly date night which was planned and scheduled one week in advance. Second, we resumed observing Chris Day and Marianna Day. On these days, once each per month, one of us picks whatever they want to do for the entire day. Having these dates to look forward to went a long way to keeping our relationship strong through the unpredictability. This year reinforced that my time has the highest value and enjoyment when I’m in a deep conversation, especially 1–1 and in small focused groups. I think altruism is the antidote for nihilism. Whenever feeling down, remember that our true purpose is to be of service to others. Each year I continue to level up in friendships. The dividends from earlier decisions (and lucky breaks) continue to compound. This year, I said “no” a lot more often. “No” to activities I’m not excited about or spending time with people who don’t bring me energy or inspire me to become better. Being more selective allows me to be more open, present, and responsive to those I care about the most so that I can deepen these relationships and be attuned to opportunities to add value. I’ve also completely stopped caring about being “cool”. There was a high school part of me that was still mildly obsessed about becoming the center of attention or being seated at the right table. Being sized up. Making the rounds. Kissing the ring. Playing the game of who can look like they are having the most fun. I’m over it. Doing fun things with fun people. Celebrating our aliveness. Commiserating in our problems shared as individuals and a species — simultaneously insurmountable and completely insignificant. Neither wasting a single moment nor keeping an eye on the clock. This is what I want. I had a lot of these moments this year… keep them coming. My primary weakness in relationships is a failure to initiate. I’m almost never the one to instigate, to invite, to follow-up, or to send the quick “saw this and thought of you”. Perhaps 5% of the time. I am thoughtful, I love making things happen, I help create amazing experiences. I just… forget. I have been so fortunate to be surrounded by friends to whom these skills come so naturally, allowing me to draft behind their efforts. I want to play a larger role, to drive the social bus. Thus, my relationship goal for this year is to transform “making things happen” from my Achilles heel into a superpower. The key to a satisfying life is novelty and the best experiences are shared. There is nothing like breaking bread and overcoming challenges in an unfamiliar environment to build deep relationships. I try to set aside two months per year to experience new cultures at ground level and battle-test my most cherished assumptions with some of my favorite people. Had some fun travels with Marianna this year. We spent two weeks in Tulum in February on a “book writing retreat” and returned in October to reconnect with 10 of my best friends for my birthday on Isla Holbox and a food tour in Mexico City. A performance in HK in June came together for MathPlusMusic and we continued onto mainland China for the next couple weeks, visiting Beijing, Shanghai, and Hangzhou. For her birthday, we ate, hiked, and explored the Swiss Alps and Tuscany. In September, we joined my family for a cruise from NYC to Bermuda. Went out to Providence for Fire Festival and back to LA for Halloween, my first visit since 2011. Took a boat out to Connecticut for the day. Otherwise, mostly replayed the classics. Multiple weekend trips upstate and to the beach in Brigantine as well as our first visit to Fire Island. Returned to Alabama for Rising Tide with another great crew. US Open, indoor skydiving, Then She Fell, Drunk Shakespeare, Levar Burton, Prom, Michelin Star Marathon, laser tag, escape the room, Present Plate, WTTF, so many amazing meals (Aska!) and concerts (Midori Takada!). Not to mention hosting over a dozen dinners, brunches, and parties at Castle Keap which somehow keep getting better and better. It’s easy to take for granted that we live in the most interesting city in the entire world. Unexpectedly, my travel schedule for 2019 is already filling up. I am currently writing this from climatically ideal Medellin, Colombia, where I will be happily based until early March. I have penciled in our biannual return to Japan for Sakura (end of March), my sister’s wedding in Wilmington (May) and Portugal for Marillion Weekend (June) with some other European stops likely to be tacked on. At the end of every workday, I subjectively rate my productivity from 1 to 10. My average score increased from 6.4/10 to 6.9/10 this year. Improvement but barely a passing grade. I was alarmed, mostly in the first half of the year, how many days I would “not feel like it” and take most of the day off. The primary correlations I found (in order) were lack of sleep, not planning my day, having an open schedule, skipping my morning routine, not leaving my apartment, and having a 10/10 the day before. On these “off days” I would play poker in off-peak hours or neurotically read random articles. Things changed drastically in July when I brought on a team and shifted from a maker schedule to a manager schedule. This update forced structure and external accountability. Still, I systematically raised the floor so that most days would be a 7 or 8 rather than oscillating between 3’s and 10’s. 1. I allowed myself to sleep in and complete my morning routine when possible, even if it meant not starting until the afternoon. 2. I added a late morning standup where I would go over my plan for the day with Rob Filardo to ensure I completed it. 3. During my weekly review, added schedule constraints and hard stops to create daily urgency. 4. I scheduled long walks in the late afternoon which replenished my energy, helped overcome sticking points, and smoothened context switches. 5. I used separate workspaces and computers for poker and consulting to reduce the temptation to switch from one to the other when I got stuck. 6. I stopped checking email and social media until the end of the day with the help of web blockers. I composed emails in a Google doc to be sent later and moved all team communication to Slack. 7. I kept my phone on airplane mode and in a drawer until 5 pm. During the evening, I keep the phone on B&W with all notifications off. I have always worked from home for the convenience of avoiding a commute and the ability to retain full environmental control. The tradeoff is that the context is mixed with everything else we do at home which can make perseverance extra effortful at times. I tested various coworking spaces but found them quite distracting and unconducive to taking frequent video calls. This year, I prepaid for a private office in walking distance from my apartment which I think will make a big difference for maintaining a strong work context. My keystone habits have remained consistent for the last five years and are chunked into my morning routine. In order of consistency, they are day planning (~95%), stretching (~90%), journaling (~85%), and meditation (~65%). My ideal is to plan the night before which happened ~ 70% of the time, with the morning serving as backup. The most common cause of skipping my morning routine altogether was choosing the extra hour of sleep after a late night. The key to maintaining consistency with a daily routine is to bring awareness of the subtle changes from day to day. These changes were felt most viscerally when stretching (tightness and resistance) and journaling (level of lucidity and emotional lens) while meditation was often much more subtle. The challenge? Meditation is effortful, can be quite boring, and there are no shortcuts. Progress compounds proportionally to time spent sitting. No sitting, no progress. The positive spin is that if you consistently sit for enough hours, a transformation is guaranteed. This year, I went on my first retreat, joined a weekly meditation circle, read several excellent dharma books, and attended many classes and talks at MNDFL with some of the country’s most respected meditation teachers. Still, I failed to maintain a consistent daily practice, treating meditation as an “on demand” habit for when I needed to be on my game. I have begun to find the various guided apps to be tedious and have been preferring just using a simple timer instead. When I did meditate, my average session length was 15 minutes. This year I’m again aiming for 30 minutes solo per day with at least one group meditation per week. I did not complete my goal of going on a 10-day silent retreat this year. Vipassana seemed too spartan and I didn’t want to commit to setting that many days aside. I do plan on spending at least 10 days on retreat this year, aiming for multiple 5 or 7 day retreats instead. My five-year goal is to complete the three-month retreat at Insight Meditation Society. 2018 was a strong year for reading with 65 books completed, up from 40 last year and the most since I started tracking. This total really surprised me as I had no daily reading habit and reading was low on my list of priorities. This was my first year utilizing a pre-selected Queue of 60 books to choose from. 25 of my books read this year came from this list. 13 of these books were a 9/10 or 10/10, 60% of the total, bringing up my average book quality quite a bit. As a result, my abandonment rate went way down. Disconnecting completely during travel for some extended reading time. I suspect that more than half of the pages read happened during the 25% of the time I spent on the road. More of a focus on immediate actionability (management and meditation) turned consumption into production. I continued to reduce the time spent on non-book media due to opportunity cost. I read half as many articles, avoided the news, consumed nothing served to me in an algorithmic feed, limited my podcast listening to commutes, and spent negligible time on Youtube. I would like to iterate upon the Reading Queue this year. It was useful to have a curated menu to choose from. However, the system felt overly-constrained and I would have preferred to make Queue replacements at regular intervals. I still manage to avoid reading many of the tougher books in the Queue and was still very susceptible to the recency effect from a single recommendation. Rather than treating all book completions equally, I am going to test a points system to incentivize starting potential quake books. I’m not reading any more business or self-help books unless they have been around for at least five years and are recommended directly to me by multiple trusted friends. While nice for padding the total, there is not much signal lost in reading a summary blog post or listening to a podcast interview with the author instead. Every minute I spend slogging through a 7/10 or lower is a minute I could spend rereading a 10/10 instead. I am also testing a guardrail on my intellectual promiscuity. This year I will not read any article shorter than 10 minutes unless it has been recommended directly to me multiple times. Counterintuitively, I have realized that the shorter an article, the more likely it is to be a waste of time. The algorithms incentivize quick takes, easy digestibility, and surface level analysis. By reading the same things as everyone else, we think the same as everyone else. Internalization of a steering principle requires sitting with a topic for an extended time with approaches from different angles. When information is abundant, true understanding becomes the differentiator. Wow, you made it. However much you managed to read before scrolling down, thank you. Thank you for caring, believing, holding me accountable and being an inspiration. Your time is a gift for which I am truly grateful. I find every minute spent working on these annual reviews is rewarded many times over. If you are considering doing a similar reflection, I would love to pay it forward by being of assistance in any way I can. Email me at chris[at]theforcingfunction[dot]com with what you have so far.